The Christmas Craft Collab: No. 1, Washi Tape Wonderland! Can you believe it's actually CHRISTMAS?!?!?! Well, not *actually* but ya'll know what I mean. It's time for the Christmas Craft Collab! That wonderful time of year where I get to collab with my very favorite blogger - THE EPICEST MADISON EVER This week's was SO much fun, and it looks super festive! Plus, it doesn't take hardly any time at all - and barely any supplies! Ready? Let's get started! Yeah. Seriously. That's it. Literally A L L you need. *smirks* Beat that, ya'll. If you want, you can use stickers, paper, and Christmas cards/photos - but that's optional. If you want a sharper look, you can use scissors. I didn't but once, and you could've gone without it. Mwhahahaa..
Our first part of this WASHI WONDERLAND?!?!? Kit, Sam! Wait up! I'm not ready, okay? Well, I guess I caught them just in time. They're simply demonstrating the first step - place a long strip of washi tape along the bottom of the wall. This is your Christmas tree base! Continue placing strips above it - making each one a little shorter. Don't worry about putting tape on walls - it peels off SUPER easily. And if you don't peel it off until forever, it'll come off on it's own slowly. And if you make a mistake, just strip it off and retry! Now, for the step where I cheated and used scissors. This is for the very top of the washi tape tree. Just cut a triangle, and voila! Sam. Look. The camera is over here. KIT STOP LOOKING OVER THERE! My dolls turned this into their giving tree - each name for a recipient was written on a little circle and then people got to pick who they would give to that year! We added a couple of close friends too. :) And DWOD dolls, don't worry - Amy already covered ya'll. Look at that colorful awesomeness! See all these gorgeous photos and cards?! They're all from EPIC bloggers... like DWOD! Since this washi tape was a bit wide, I cut it down the middle. You can always use not-so-wide washi tape if you wanna make it even easier (lazy people...). Or this method, so you can still read the inside. At first I didn't like the weird way I taped it, but now I think it's kinda cute! 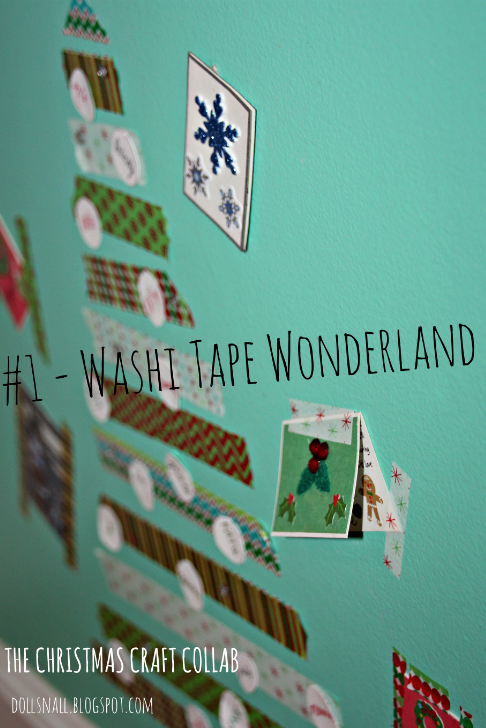 So, there you have it - a Washi Tape Wonderland! Go even crazier than me and make washi tape snowflakes, streamers, banners, and.. whatever else you think of! But before you do that, do this and send me an email along with some photos at dollsnall4ever@gmail.com. I really hope to see some flooding my inbox - especially with how easy this is (don't tell me you're too lazy...)! You'll be featured in the end-of-the-holiday crafters post where we'll... well, feature you. *facepalm* That was redundant. *shrugs* I've been too distracted by Madi INCESSANTLY TEXTING ME *smirks* to focus too much on anything. XD Even good ice skating books or ballet books like the uh, research ones for the Nutcracker! Anyone excited for that? I'm thrilled - you'd better be too! Don't be a procrastinator and ignore Madi's post tomorrow, okay? Hope you have a really, really MERRY CHRISTMAS! If you want to read my rant about some 'winter' signs, highlight the above. But I don't want to offend anyone, so don't read it if you think you might be offended by Merry Christmas. But still, Merry Christmas, ya'll! I should probably go make sure my CCC post is scheduled since I haven't touched it since Tuesday. Heh heh, whoops. Hehe. That's what I was doing. Like, "Oh, I'm being such a good girl and not procrastinating. I took the pictures and uploaded them and everything...." Today: WHAT IT'S NOT READY WHAT WAS I THINKING AUGH AUGH AUGH! OH MY GOSH *panics with you* Ahhh!! Do you think you'll film it today and post it early in the morning or something? I AM SO EXCITED FOR YOU! What?!?!?!? Do you never go to craft stores?!?!?! Oh! What a creative idea! I love it! So this is a super random but is Samantha a Pleasant Company? Oh, oh, oh: those look AWESOME!!! The only problem is...*gasp* I don't have washi tape...*gasps again* and I was planning to do all of the CCC crafts. *sigh* I will do the next one, I PROMISE. Thanks! WHAT?! GO GET SOME RIGHT NOW RIGHT NOW RIGHT NOW GO GO GO! So cute!! I LOVE the Christmas tree! If I find time I'm definitely going to try it!! Thanks! If you do, make sure to send a picture!